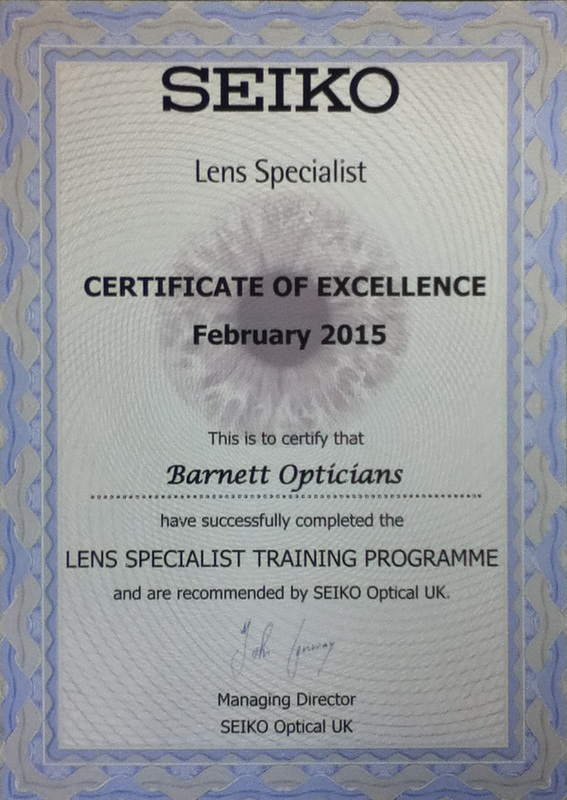 Barnett Opticians offers a wide variety of lenses. We are also a SEIKO lens specialist (see the certificate at the bottom of the page):SEIKO has been at the forefront of lens technology for almost 50 years. As an independent optician, we are also able to supply lenses from most other suppliers, including NIKON, Zeiss, Essilor, Hoya and Shamir. As their name implies, these are corrective spectacle lenses with the same prescription over their whole surface and are available in an extensive range of materials and powers. They are used when you want to have the widest field of view for general use or a specific focus - for example, for driving, intermediate or reading lenses, and are available in the widest possible range of materials and powers. As our eyes age, their ability to focus over different distances diminishes, but varifocal lenses can compensate for this, with advanced designs helping to prevent blurring and distortion. Varifocals, sometimes called progressive power lenses or multifocals, are lenses which have a gradual power change over their surface. Generally the power alters from your full distance correction at the top, to your full near focus correction at the bottom. There is no noticeable dividing line on the lens surface, improving the cosmetic appearance and visual performance of the lens. The latest designs, including customised SEIKO Superior and SEIKO Emblem varifocal lenses, aim to provide the greatest ease of use with optimum visual performance. Our experience shows that most people are able to wear them immediately with a minimum of adaptation. There are times when conventional varifocal designs are not completely suitable. Some occupations, e.g. those of pilots, electricians, mechanics, librarians, and painter/decorators, place different demands on our vision. Occupational lenses (sometimes called enhanced reading or computer lenses) are used in such cases where intermediate and reading vision need to be combined. They are especially useful for office workers who need to see both their computer screen and work on their desk. Occupational lenses will provide limited or no distance vision and are not suitable for driving or outside wear. We find that they are very useful for those who find their distance vision is blurred when they look up in their reading glasses and are often supplied as an additional pair of spectacles, or as more versatile reading glasses. Mark Nelson uses occupational lenses when he's testing your eyes! Bifocals are used when you need to be able to see two different distances when wearing the same pair of spectacles. They are usually made with the distance correction in the top or main part of the lens and the near vision correction in the lower part or smaller segment. There is a line on the lens, dividing the distance and reading portions. The reading segment is placed so that it does not interfere with your vision when you look straight ahead through the distance portion of the lens, but is easily accessible when you look down at something nearer. This will provide you with many advantages, including better vision, especially at night and more attractive spectacles with almost invisible lenses. The special treatment to both surfaces of your lenses allows light to travel through them more easily. This reduces the amount of glare which helps when driving at night or working at a computer screen all day. Because there are fewer reflections, people can see your eyes more easily too - important if you work with people. The best coatings incorporate a special treatment to prevent anything sticking to it - it has excellent dirt, oil and water repelling properties and is very clear and scratch resistant, providing optimum visual clarity and comfort. The slimmer your lenses, the wider your choice of suitable frames. 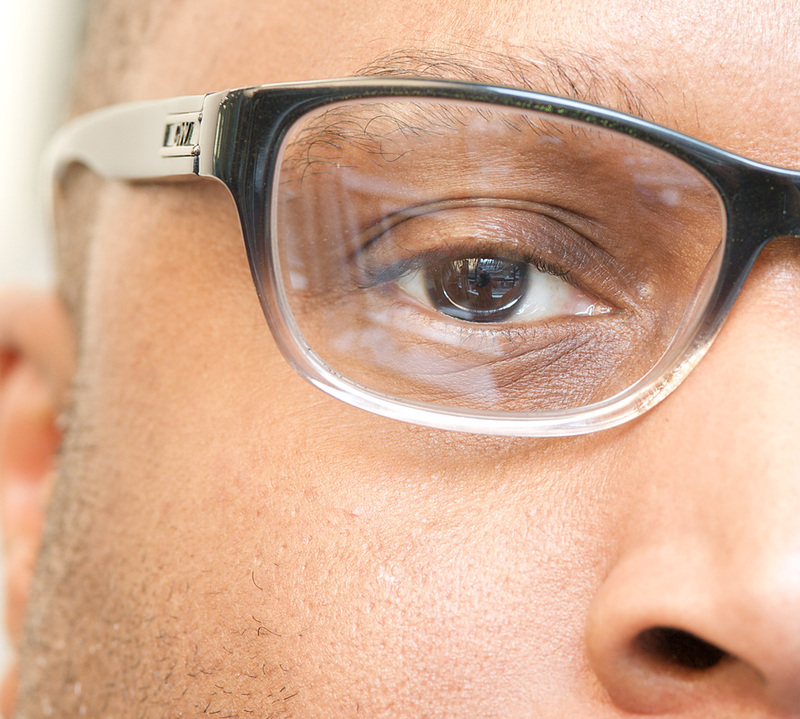 Lighter lenses also make spectacles more comfortable to wear, and greater clarity reduces eyestrain and discomfort. Transitions lenses eliminate the need to switch between spectacles and sunglasses. These ingenious lenses have an adaptive tint that reacts to ultraviolet light by darkening to block out harmful UV rays. When you return indoors, the lenses become clear again to maintain sharp vision in all lighting conditions. Ordinary tinted sunglasses only reduce the amount of light reaching the eye. Light reflected from water or a flat surface can still cause unwanted glare. Polarised lenses provide a light filter and also block glare so they are ideal for sport and driving. The best option for sunglasses. Excessive sun exposure can be harmful to your eyes. UV blocking lenses will absorb UV light, providing comfortable protection for your eyes. This is particularly important for young eyes, those at risk of macula degeneration and for all those who spend time outdoors. This is a hardened surface that will help to reduce the number of scuffs on plastic lenses during everyday wear. It will not prevent scratches completely, but with careful handling can help your spectacles retain their pristine appearance for longer. All purchases of SEIKO lenses are accompanied by a SEIKO lens authenticity card, which provides a unique reference code that allows entry to a regular draw to win a SEIKO watch. A growing number of patients from Barnett Opticians have won SEIKO watches through this promotion, some of whom can be seen with their new watches here.